I wanted to do this to be healthy and have more energy for my 6 month old son. I really enjoyed the program and couldn’t be happier with my results. Having a plan really kept me on track. After seeing that I lost 10 pounds in week one it motivated me to keep going. At the end of weeks 2 and 4 I hit about 3 or 4 days where I stopped losing weight. I kept working harder until I started seeing more results. Weeks 1 , 3 and 5 are the weeks I really dropped a lot of fat. I went from 213 pounds to 175, feel stronger than ever, fit in my old clothes, have way more energy and have cut back to half my dose on blood pressure medicine. A lot of my friends and family are impressed by my results and are going to try the next challenge. Thanks for everything!! 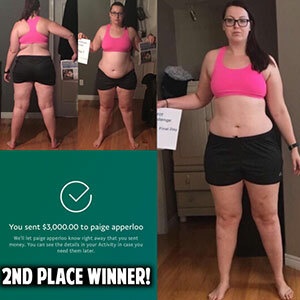 I’ve followed Paige on Instagram & seen the amazing transformations from her #Fitin5. I thought about signing up many times but it wasn’t until November that I finally took the step! When signing up, I never expected to make the top10. I thought to myself there are so many people that get abs & have amazing bodies there’s no way it will be me! I was ECSTATIC to find out I made the top 5!! But then came the criticism for putting my body out there. I saw numerous comments about “#10” got a tummy tuck & “#10” is not real or that can’t happen in 5weeks. Well I’m here to tell you IT CAN! I was looking for a change, and the Fitin5, was one of the best things that I ever found. During the program I decided not only to change my habits, but change the habits of my whole family. My oldest soon started to practice Jiu Jitsu with me, my youngest start to practice Judo, and my wife went to the gym as well. We removed junk foods from our diet and started to eat healthy. Everything changed in my home. Thank you Paige!!! Thanks for helping me with developing my focus and giving me the initial tools to be as successful as I have been. My experience with Paige has been amazing. This has flipped my world over in so many goods ways. Paige made sure I accomplished all my original goals in just a short time (9 months). I am healthier, physically and mentally more then I have ever been in my life. From the different types of work outs to help grow muscles throughout my body, to a special diet plan that helped fight and burn fat and keep healthy at the same time has been on point. Any random questions or concerns were easily answered through email throughout the weeks. It has been a challenge every step of the way but was 100% worth it. I would recommend Paige Hathaway to anyone. In those short 5 weeks I lost a total of 15 pounds and many inches around my body. I’ve lost an additional 8 pounds since the end of the challenge and couldn’t be happier with the results. Unlike every other plan I’ve tried in the past this is one that I can happily say is sticking and I’m happy to make this my new lifestyle! The weight loss is amazing, but being able to have my willpower and motivation back is priceless. I can’t thank Paige enough for all of her help in my weight loss journey and I will forever be one of her biggest fans!!! I have to say this challenge has changed me in so many ways. First off my confidence has been boosted on so many levels. Physically how I have changed and second mentally that I got threw one of the hardest and most rewarding experiences. The amount of information that Paige gives you threw out the challenge and how she is actually there training you threw it is just amazing. Also I have truly learned what my body likes and doesn’t like. Learning to weigh out my food has become a healthy habit of mine all because of this challenge! Thank you Paige!!! First off I just wanted to say thank you for putting this challenge. I can only imagine how much time and effort it took to put all this together! That first week was truly a test because, I had never followed a strict diet like that before. After that first day it was a grind each and every day but it was a grind I enjoyed because I knew there was others out there working just as hard. I hate to lose and be out worked. That’s the type of person I’ve been all my life. Especially when I was involved with my college sports. This challenge has helped in a way that now I know what it takes to reach a fitness goal. 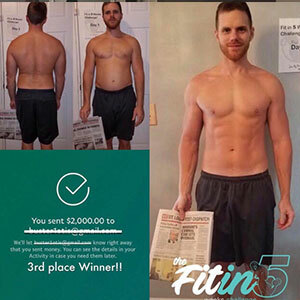 For so long I thought I knew, but it wasn’t until i followed this plan and started to see results where I really found out. I will 100% take this knowledge you have given me and use it every day! I never want to go back how I was. I want to get better & better every day and who knows, maybe strive go be a part of a fitness team! After this challenge I can really see myself pursuing that! Thank you once again, Paige you truly are the best! I started the challenge at 161 lbs and ended at 144 lbs. Seventeen pounds down and I feel fantastic! I can ALMOST see my abs. Getting there. I’ve also always been self-conscious about my arms which are the most stubborn part of my body and I can finally see them slimming down. This #Fitin5 Challenge has helped jump start my personal challenge of losing the pregnancy weight. I wanted to quit so many times in the last 5 weeks because I was so exhausted from my “mom duties” plus having a full time 9-5 kind of job. But what people don’t see from these pictures is the mental resilience and newfound discipline I gained while participating in this challenge. 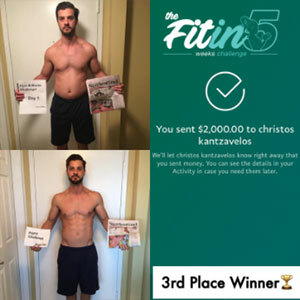 I’m determined more than ever to continue on with this fitness journey and #Fitin5 provided me with some of the basic tools I’ll need for success. This is only the beginning for me and there’s only one option for me and that is to keep moving forward. 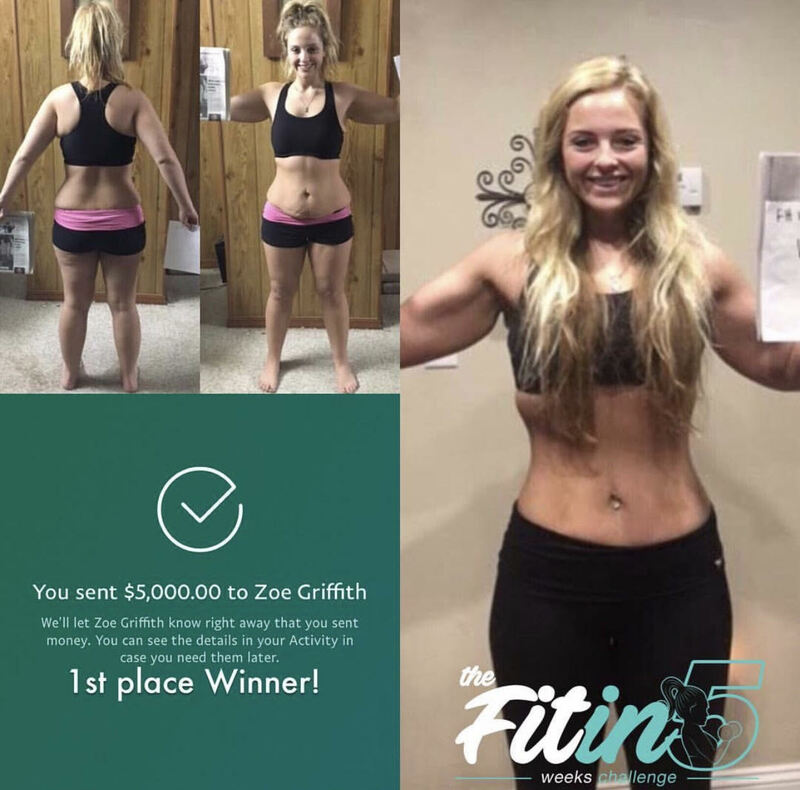 Thank you Paige Hathaway for the opportunity to do the #Fitin5 Challenge! It meant a lot to me that I got through all 5 weeks! I wanted to let you how grateful I am for all of your help! Honestly I’ve been struggling with my weight the past couple of years and it felt like nothing I tried would work. I actually started to feel like my body was incapable of losing weight and I would be uncomfortable in my own skin forever. You seriously are such a blessing and I can’t express how thankful I am for you!! 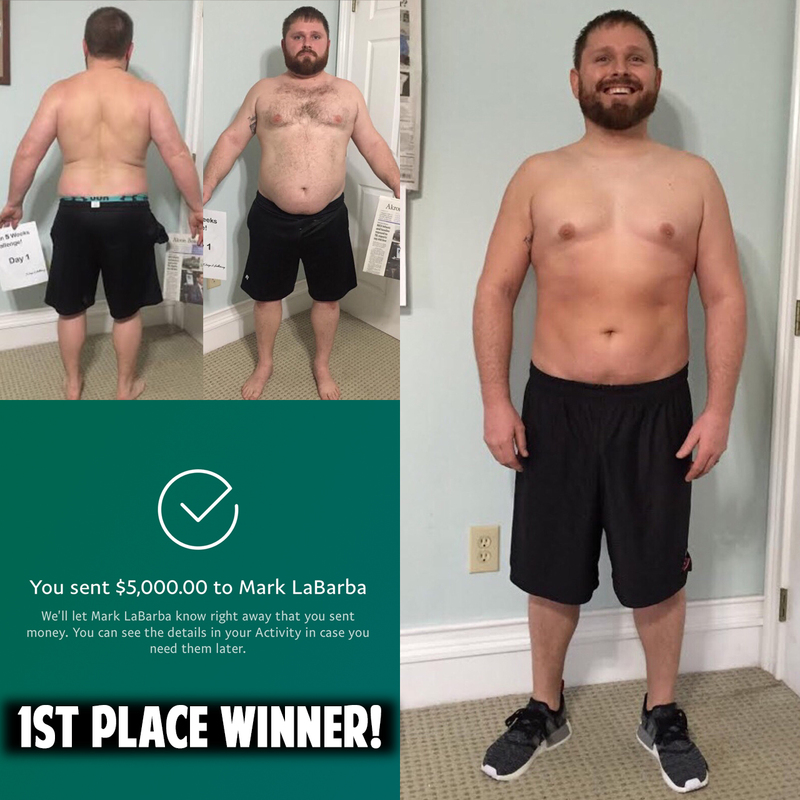 I’ve lost a total of 15 pounds on your program and couldn’t be happier ? I’ve also gained back my confidence which is even better! You helped me re discover the willpower I once had and you are a constant motivator for me. Thanks to you I now have the tools moving forward to continue this healthy lifestyle and keep bettering myself day by day. You’ve helped me get my life back so from the bottom of my heart I want to say thank you thank you THANK YOU!!!! This challenge has taught me SO much about living healthy, eating healthy, and taking care of my body. I have learned so much about muscles, nutrition, workouts, and more! I started very tired and annoyed at anything, the workouts, the diet, and events. I hated going out and not being able to eat everything and drink. Now, after 5 weeks, I can’t wait to go out and enjoy life, while still taking good care of my body. I understand more what my body actually needs, and what it WANTS. And, I am a LOT better at not giving into my body’s wants. During this challenge, I pushed myself to do the workouts when my body (and mind) really did NOT want to. Now that it is complete, I realize that not giving up when things get tough is a valuable lesson that I’ve learned. Life is not easy, and if you want something bad enough, you simply have to put in the work. Thank you Paige for helping me revolutionize my life! Thank you so much for this challenge! It has been awesome and really opened my eyes to a whole new world! I’m excited to continue my fitness journey even after the challenge. I’ve seen such great results and can’t wait to see what else I can accomplish with all the goals I’m going to set! More about me.. I’m a restaurant manager and currently am working ALOT, so sometimes it’s hard to get in the gym, but I’m making it work. When there’s a will, there’s a way. I used to model when I was younger but since I’ve put on weight I stopped. My goal was to get that body back with this challenge. I know I’ll never have the same body I had as a teenager but I’m pretty close now and that’s all thanks to the challenge! I have a twin sister I don’t get to see as much as I’d like and one thing we both look forward to doing now is working out together when we can! She has been the one to push me when I wanted to give up. Shout out to Emily!! Love you! ?I’ve lost 14 pounds if fat, now I want to gain a some muscle! Can’t wait to see myself in a year! I wanted to say thank you for this opportunity and for helping me. When the cancer hit back in February…. When I had two surgeries back to back… When my body couldn’t catch up and fight off what I needed to…. When I had hit a wall of frustration and a point in which I wanted to give up… Your challenge helped save me and get me back to a good mental state and physical well being. I started this at 197 lbs and have got down to 180 lbs. I’m not sure where I started with body fat but I’m assuming about 20%. Today I checked and it’s below 13%. Doctors told me it would be extremely difficult to get back to where I was and I thought it would be impossible but you helped me do it! I’ve learned a ton about new ways of lifting and different ideas and ways for dieting plans/eating healthy. All of this happened because of you and I greatly appreciate it. Only 5 lbs more and getting back to below 10% body fat and I’m back to where I belong and started. I now know cancer ain’t got nothin on me! ?thanks again! I gained weight while living in Italy, and then working at a brewery in Colorado so I had ten pounds I just could not seem to get off, even though I was working out. Your challenge helped me realize what and how much food my body actually needs, and I had incredible sustained energy the whole time. My sugar cravings disappeared and I always felt incredibly satisfied. The workouts were challenging but fun because I was progressing quickly so it really changed my life. I’m running again, doing yoga again, and eating in a way that makes me feel and look amazing. Thank you so so much for having this challenge and I look forward to doing more! Omg Paige! I just want to thank you for such an incredible experience! This challenge has blown my expectations and has given me the belief and confidence knowing that anything is possible! i have trained weights at the gym for years now but my eating has always let me down and cardio was non existent! But once you combine all three and change your mindset…. Wow!! I have officially lost 22 pounds in 5 weeks going from 215.6lbs to 193.5lbs and after a body scan I found out that 24 pounds of fat was shredded off me as I went from 28.6% body fat to 19.8%! And I actually managed to gain around 2 pounds of muscle too ? the training was tough but with new abundance of energy it was great and the food variety was huge and well Lets just say I was never hungry that’s for sure!! To say I highly recommend this challenge would be an understatement and if anyone is looking to not only change their physique but also their way of thinking then Paige Hathaway is your girl!! Get ready to see the best you, you’ve ever seen!